Here are the five candidates, from all of the five major parties in England, standing for election as our new MP for South Cambridgeshire. General Election 2015 (Pt.2): How does South Cambridgeshire vote? South Cambridgeshire was only created as a constituency in 1997, so we have just four General Elections to look back on. General Election 2015 (Pt.1): What Constituency is Queen Edith’s in? Most people in the area assume we’re in Cambridge. But it was decided a few years ago to ‘donate’ Queen Edith’s to the South Cambridgeshire constituency. The South Cambridgeshire constituency now has a full slate of candidates from the five major political parties for the 2015 General Election. Here they are. How on earth did something as hideous as “The Marque” get built? The city council commissioned a report to try to find out, and it’s just been published. 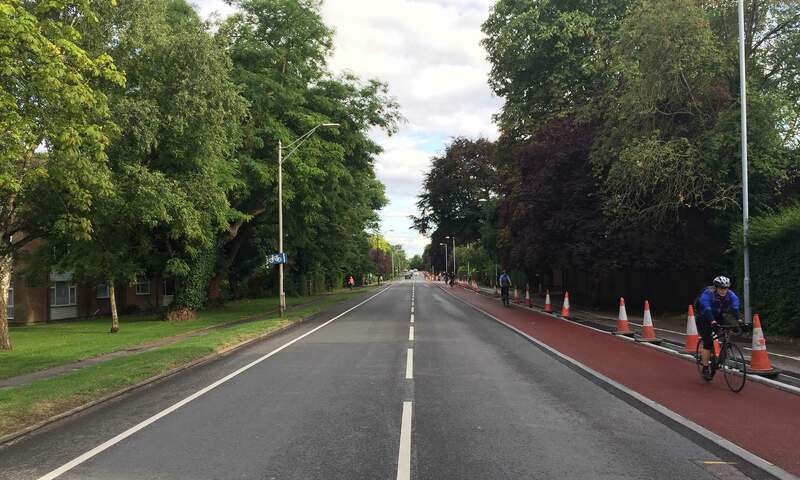 The remodelling of Hills Road to accommodate ambitious cycle paths, continues to cause some controversy between some residents and the council. There has been considerable disquiet amongst members and visitors over a decision to make three of the seven rangers redundant. This meeting was appalling, exposing the sheer awfulness of the whole system, from the way different parts of local government don’t talk to each other, to the exclusion of the public from decision-making. The bimonthly South Area Committee meeting of Cambridge city councillors is coming to Hills Road, and there is a public speaking slot too. The columns are taller, and can light up a wider area, but it seems to me that this just appears to have allowed a reduction in the number of lights. The corner of Luard Road and Sedley Taylor Road catches both car drivers and cyclists unaware, and has been the site of regular accidents over many years. Several well-researched submissions by local residents are known to have been provided, with the authors also planning to present their case in person. Getting perilously close to becoming a community newsletter! I was rather hoping this blog had finished with the EF Language School development, but over the last few weeks, there’s been wholesale destruction of the greenery around the site. This blog isn’t intended to be a community newsletter, but here are some of the publications which might bring local events to your attention. I’d strongly encourage all local residents to wander over to Rock Road and take a look at the library display today. Queen Edith’s has a new councillor, and it’s Viki Sanders of the Liberal Democrats. By arranging this event, Homerton really showed Cambridge City Council how local democracy could – and should – be brought to the people. Without rashly predicting who’s going to win, I reckon the winning candidate’s vote share will be low, and the gap between first and third places smaller than it’s been for years. I’ve compiled a short guide to the details of our forthcoming byelection, including a list of candidates and links to their websites. A short article looking at forthcoming local and national elections, discussing which parties might be most sympathetic to those wishing to reduce or prevent Green Belt development. Including: if you get a visit from a prospective candidate, what issues should you be raising with them? The South Cambridgeshire Conservatives have selected Heidi Allen to be its candidate in next year’s General Election, after Andrew Lansley’s retirement. The election itself will be held on Thursday 13th November. Councillor Birtles’ resignation still does not have any official explanation. On a personal level, I have found Councillor Birtles to have been approachable and effective as a councillor, and her resignation will be a loss to Queen Edith’s. The South Cambridgeshire Conservative Association has chosen a shortlist of four to be the party’s candidate for the next election. “The Marque” development has been nominated for a major award – but don’t worry, the world hasn’t gone mad, it’s for the “Carbuncle Cup”. Balfour Beatty project manager David Callow tells me that the work is scheduled to be completed on 26 August. Few subjects get people worked up as much in Queen Edith’s as parking, and it’s not surprising, because the attitude of so many drivers is that the law, courtesy and consideration are things that only apply to other people. What are the Area Committee Meetings for? I raise this point because I think the council should either make this clearer, or change the format of the meetings to make them more public-focused. “The Good, The Bad and The Ugly” will be looking at how successful we’ve been (or haven’t been!) at making this area an attractive place to live. Over the past couple of weeks I’ve had the chance to communicate with all of the candidates. Here’s what I’ve found out. Simply by reading the page I’ve put together, voters of Queen Edith’s will have far more idea about what they’re voting for than residents in any of the other 13 wards of the city. Could Queen Edith’s provide a shock election result again? In 2012, Queen Edith’s provided the most surprising result in the whole of Cambridge when it elected its first-ever Labour councillor: could it provide a shock again in 2014? Indications are that there’s going to be more competition than last year, as I’ve already had information from three candidates through my letterbox. Councillors surprisingly went against the advice of their own officers and approved a proposed development on the corner of Hills Avenue and Hills Road. The main decision to be made seems to be whether to go for a cycle path partitioned off from the road by a kerb and posts, or one which has no barrier (but is wider). Armed with a fair amount of government money, the council is planning to create wider and safer cycleways which go far beyond painting lines on the road. The City Council met on Thursday to vote on its “Local Plan”, which will direct development in the area for the next 15 years. The result was a formality. A special meeting of the City Council takes place this Thursday to consider two petitions objecting to aspects of the proposed Local Plan for the area. The clique of county councillors called the “cabinet” has been stopped in enthusiastically leaping on the development opportunities looming off Wort’s Causeway. The County Council has today been ensuring it plays its part in facilitating the locally unwanted development on the Green Belt in Queen Edith’s. Last night I attended the first “South Area Committee” meeting of the year. I felt many of the 20-30 members of the public there came away unimpressed. The Save The Cambridge Green Belt Campaign has produced this short guide to the otherwise rather baffling process of commenting on the local Council’s draft local plan.